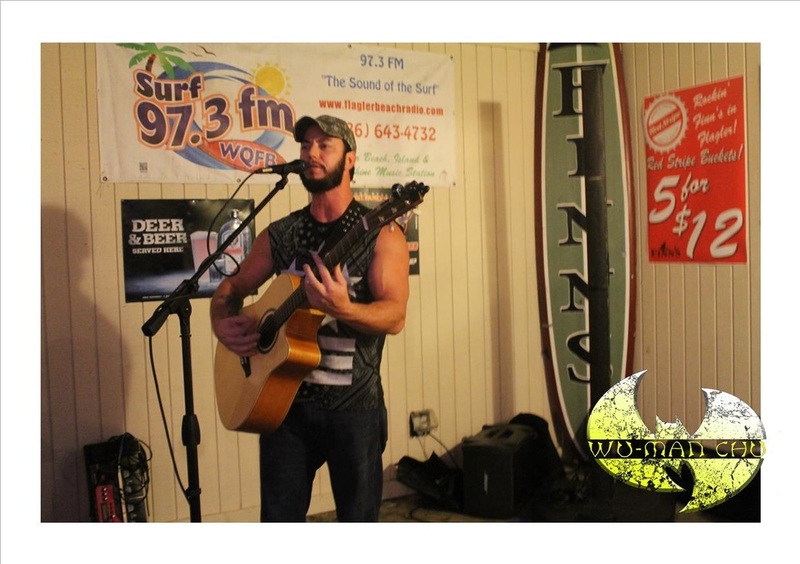 FLAGLER BEACH, Fla.—Jason Koivula rocked the stage at independent artists’ night at Finn’s Beachside Pub. It was part of the final competition round at independent artists’ night, before the finals. The event was sponsored by Red Stripe Beer and the judges were from WQFB Surf 97.3 FM. He was the direct support. Next A’Kin, Gail Carson, Sam Seas, Bradley Griese and Michael Cooper were the opening act. Uncle Eddie and Robin was the headlining act. Koivula provided vocals and played the guitar. Before Koivula began his recital with “Devil Underneath”—Tony Paul Pearl, vocalist and guitarist of Next A’ Kin, introduced him to the spectators. After Pearl parted the stage, Koivula approached the microphone and greeted the audience. He encouraged everyone to enjoy their beverages and mentioned he was a bit a nervous. He looked to overcome his nervousness by sharing fun times with them, as he performed. He spoke of how he was part of the Jacksonville, Fla. band, Salem Hollow, and they could be found on a specific social networking site. He urged them to check it out, if they were interested in the music he was about to present. He went onto say the song was inspired by the illusion of knowing someone and how they were someone completely different, as time passed on. After Koivula wrapped up “Devil Underneath”, he thanked the audience for their applause. He was unable to provide a story which inspired the songwriting process for the song and continued with an opening instrumental to begin “Battle”. After providing a few strums of his guitar, he provided lyrics. When the song was approaching near end, he played the bottom strings and finished the song off. Afterwards, he thanked the audience and he continued on with his third song, “Ashes”. During the bridge of the song, he alternated with instrumentals with a couple set of lyrics. “Conquered Fears” brought an end to Koivula’s showcase. It began with a lengthy instrumental, before he incorporated the first verse. Before he parted the stage for Uncle Eddie and Robin’s set, he played word association with his band’s name. He mentioned “Salem” can be linked to the city of Salem, Mass. and how “Hollow” can be linked to the story, “Sleepy Hollow”. He reminded them to check out his band online and looked forward for all acts to stay connected after the competition came to a close.